The Partners for Amtrak Safety and Security (PASS) program encourages community members to sign up, and personally assume the challenge of Protecting America’s Railroad. 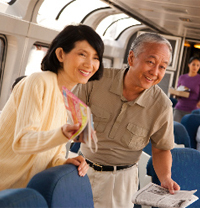 Help maintain a safe rail network by joining Partners for Amtrak Safety and Security. We need your assistance as an additional set of eyes and ears, alert to anything unusual or out of the ordinary that you may witness. If you wish to participate, please complete and submit the form below. Upon completion, an email will be sent to you containing a link to a printable version of your Partners for Amtrak Safety and Security Card. Thank you for your interest in the Partners for Amtrak Safety and Security Program. Remember that Partners for Amtrak Safety and Security Program membership does not authorize anyone to trespass on railroad property. Remember to cooperate fully with Amtrak Police or other law enforcement when contacted. If suspicious activities are noted, report it to Amtrak Police at (800) 331-0008 or local law enforcement officers by dialing 911. Do not take any further action! I understand that trespassing is a criminal offense and that I may be arrested and prosecuted if I trespass on railroad property. I will not trespass on any railroad property or right-of-way.